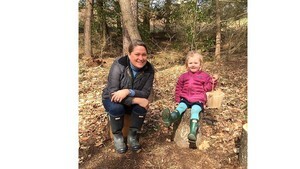 Stacey Gummey believes young children should spend a good part of their day outside, regardless of the weather. “'There’s no such thing as bad weather, just bad clothing,'” said Stacey, quoting a popular sentiment among outdoor devotees. But being outside is about so much more than fun. It’s a wonderful way to learn, and engender a strong connection with -- and responsibility for -- the earth and life on it. Gummey runs “Drop In On Nature,” offered by The Land Conservancy for Southern Chester County. 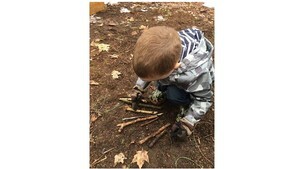 In this preschool program, children spend one or two mornings a week on a private, seven-acre property in Kennett Township known at the Bucktoe Preserve Annex. The wooded land is full of trees, plants, hills, walking trails and a small stream – places where the kids can run, dig, build and think. “This place is really magical to children,” said Gummey, who lives in Chadds Ford. “Miss Stacey,” as she’s called by her students, is a warm and energetic woman who believes intensely in the importance of children relating to the outdoors. The program, fashioned after Forest Kindergarten, which itself will be offered by The Land Conservancy in 2018, has no traditional lesson plan for the day. “It’s child-led,” Gummey said. “They pick what the day is. That’s the curriculum.” Gummey studied the concept at Cedarsong Forest Kindergarten on Vashon Island in Washington, which based its program on a German model. Lessons grow from the direction the children follow. Although Miss Stacey is always there, she is more of a guide than a leader. She said the approach was a new one for her, and initially not the easiest to implement. “It’s hard for me, having studied early childhood education and having been a director of a school in Washington, D.C. It’s very different,” she said. “I was used to getting down on the ground and playing with them.” But that’s where the learning starts. She gave an example of the children – or “friends” as they’re called – wanting to build something with small tree limbs collected in a shed. They found a place they liked, next to their climbing tree, and ended up leaning them against one another to form a small tepee. But the playing that children do is all part of learning. “Some people ask, ‘How do they learn enough to eventually attend a more traditional classroom?’” Gummey said. She gave some examples: Creating letters or names with fallen bark; counting native plants, trees and animals; measuring leaves, trees, rainfall and animal tracks; making paint from berries, grass and flowers; noting the difference between heavier rocks and lighter rocks – which falls faster? Stacey said when the “friends” build something, the process includes planning, creating, engineering, teamwork, follow-through and imaginative expressiveness. The program size is kept small so the children can get individual attention. Currently there are six children enrolled who regularly attend the twice-a-week sessions from 9:30 to noon, with others coming one day a week. Classes run from September through mid-June. This fall, sessions will be offered three days a week, leading up to five-day-a-week kindergarten starting next year. There are fun spots -- or “camps” as the children call them -- around the property. Among them: A tent with a table and bench; a pow-wow area; a sandbox; a playhouse, where they go to tell stories; a meadow; and the inviting stream that’s home to frogs, salamanders and numerous other creatures. A garden is planned on raised beds. “We looked through magazines and decided everything we’re going to plant. It was a collaborative decision. And later we it get to eat it,” Gummey said. There are sheds that hold the wood that can be used to build things. Children are taught the correct way to use a small hammer. There’s also a building on site when a bathroom is needed. Perhaps surprisingly, there’s also a meditation area, with small stumps fashioned into stools. What do they do there? But just as important, it’s a place where they can go and just relax and be quiet. Stacey put a lot of thought into its placement. “I tried to pick a spot that was [near the stream] but it doesn’t trickle as much. You can really listen to the trees when the wind blows, and especially the birds,” she said. All the local nature, including the many species of birds in the area, are a source of endless fascination for the children. The concept of taking care of the natural world through conservation is stressed to the children. “We talk a lot about stewardship. I explain to them a lot of salamanders live under rocks, so we don’t want to step on those rocks. There’s a lot of life in our streams,” said Gummey, who is a Pennsylvania Master Naturalist, a title granted through an ecology program that includes rigorous scientific training and volunteer work. She believes only good will come from encouraging children to connect with the outdoors.